Add your own words to this Dog Shaped Word Art Print, to create a unique piece of art or a gift for a dog lover. 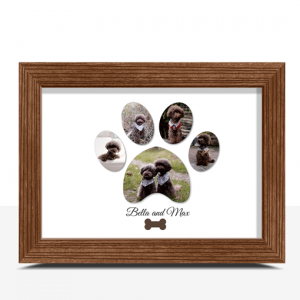 Available in a variety of colours with a selection of different frame styles. A few ideas would be to add important dates, favorite places, friends or family names etc. Of course you use your own imagination to customise the print with any words you want to fit your own requirements. 3. Choose the colours of your word art. 4. Add the words you want included on your print. Example: Paw Prints, Woof, Dog, Mans Best Friend, Bone, Cute, Fetch, Sniff, Doggy, Walkies, Furry. 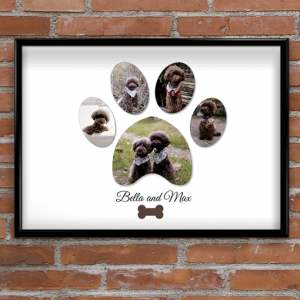 Add your photo & text to create your own Personalised dog paw photo print. 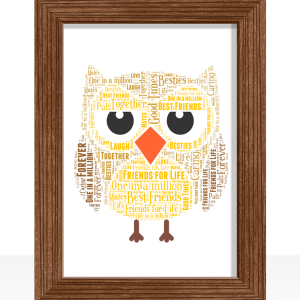 Add all your own words to personalise this Owl Word Art Print. 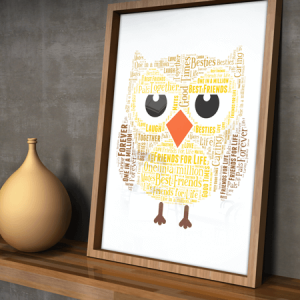 Add your own words to this Cat Shaped Word Art Print, to create a unique piece of art or a gift for a cat lover. 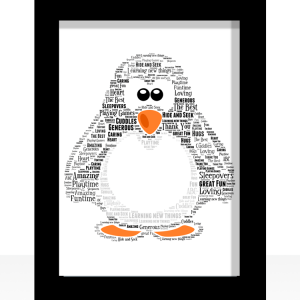 Personalise this cute Penguin Word Art Print with all your own words.